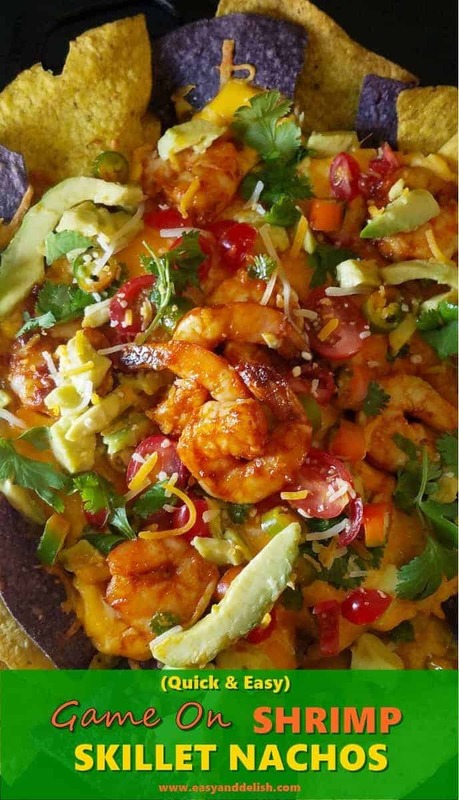 Game On Shrimp Skillet Nachos that are easy to make with tortilla chips, nacho sauce, shrimp, avocados, and salsa. This ONE-SKILLET dish makes the perfect pick-me-up for games or casual entertaining. Do you love watching sports, like March Madness? How about Major League Baseball? 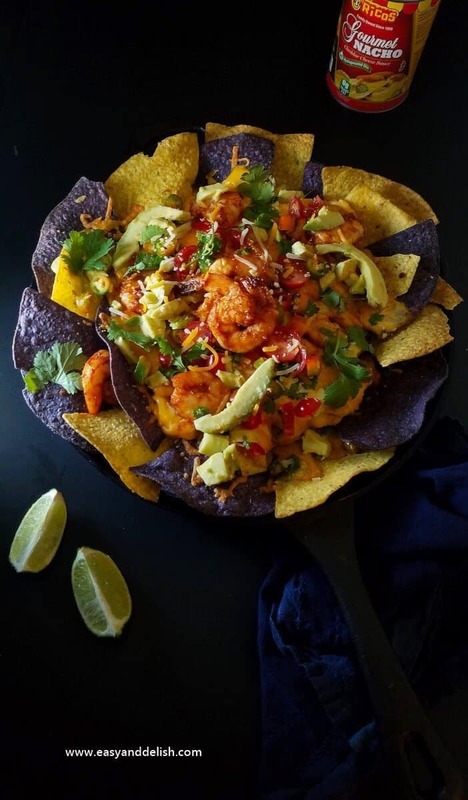 No matter what is your answer is, these Shrimp Nachos are game on! They are rich, satisfying, and quick to prepare, making the perfect treat for games and casual entertaining, too. To prepare them, all we need to do is season shrimp with a store-bought taco seasoning mix. Heat a medium ovenproof skillet over medium heat, add oil, and cook shrimp for about 4 minutes. Then, squeeze on lime juice and place on a plate or in a bowl. Layer a thick layer of chips, both purple and yellow, in the same skillet used to cook the shrimp. Drizzle the nacho cheese over the chips, spoon on half of the cooked shrimp, and scatter on the shredded cheese. Repeat layering once more. Next, bake at 350 degrees F for about 5-10 minutes, or until cheese is melted. Remove from the oven, top nachos with avocado, tomatoes, red onion, Serrano or jalapeno peppers, chopped cilantro, and a squeeze of lime. Serve warm with sour cream and/or lime wedges. 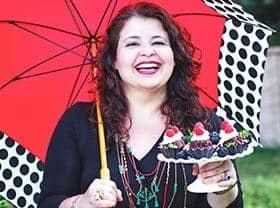 This is the type of recipe that doesn’t require any special skills and is quick to make. I am telling you, honey, this is one of the tastiest appetizers ever. 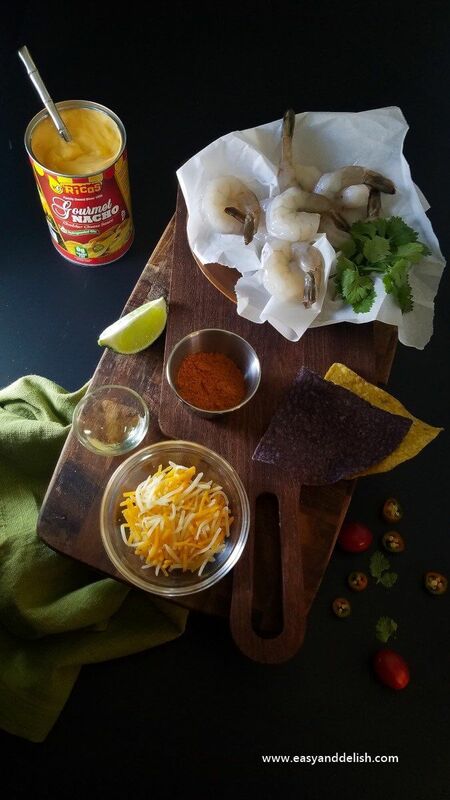 In addition, all the ingredients for our Shrimp Skillet Nachos are conveniently available at Walmart — including Ricos Gourmet Nacho Cheese Sauce which is trans fat FREE and made with no hydrogenated oils. 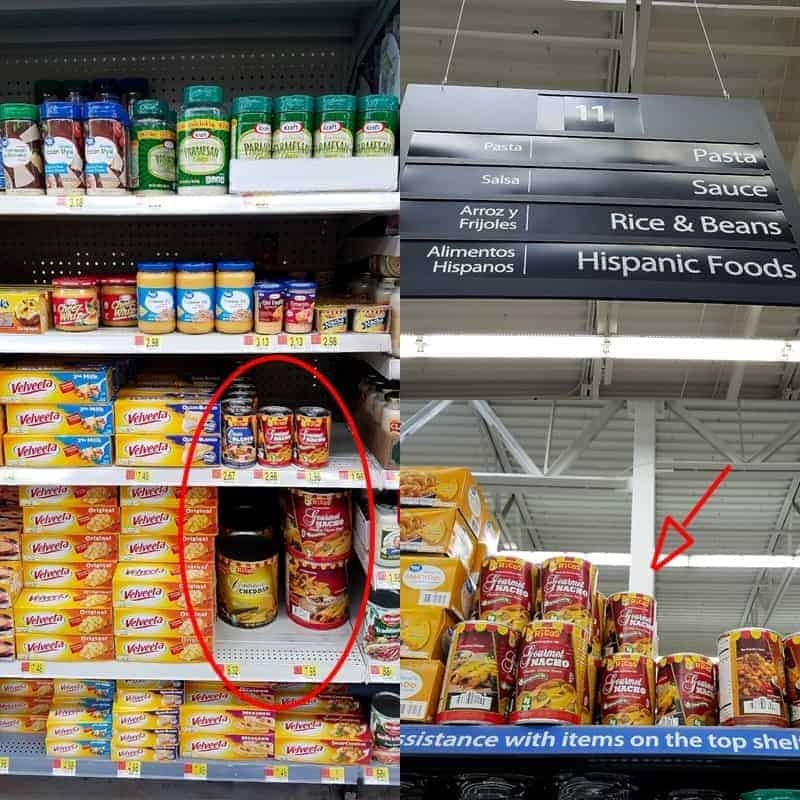 Actually, Ricos has a entire line of cheese sauces that are great for parties, birthdays, holidays, bbqs & other occasions. For more info about Rico’s cheese sauces, delicious recipes like this one and also our Pizza Bomb Nachos, take a look at their website! But no, that’s not all! Would you like a chance to win a 2018 Ford F-150? Learn how to participate and also ENTER THE SWEEPSTAKES HERE , which goes live from 1/15/18 to 5/31/18!!! Just picture yourself driving that truck everywhere. 😉 Good luck! 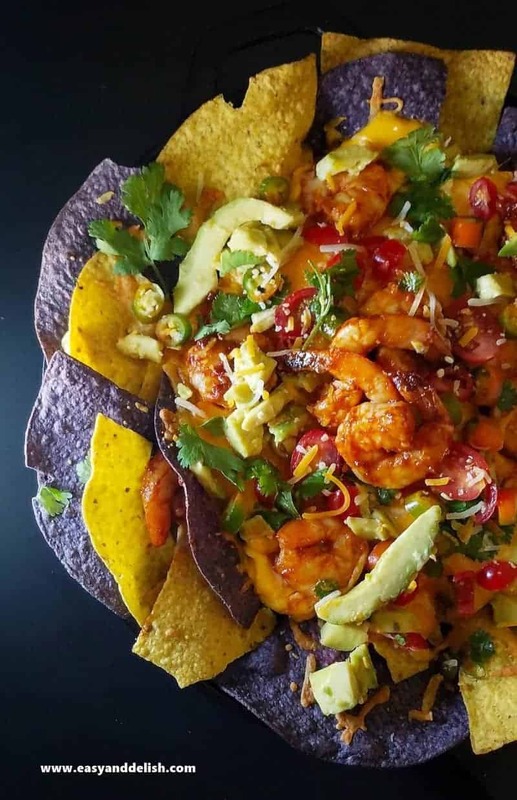 Game On Shrimp Skillet Nachos that are easy to make with tortilla chips, nacho sauce, shrimp, cheese, fresh toppings, and herbs. This ONE-SKILLET dish makes the perfect pick-me-up for games or casual entertaining. Anything shrimp always get my attention! 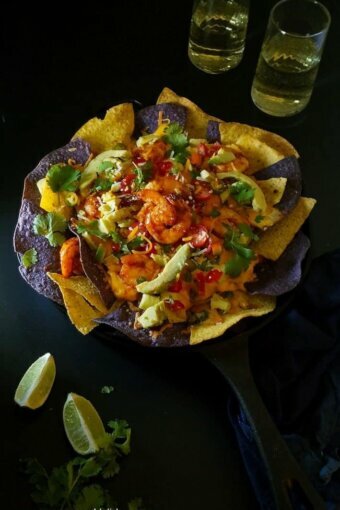 Gorgeous and flavorful nachos, a wonderful way to enjoy shrimp. Best. Nachos. Ever! These look terrific — love the idea of the shrimp. Good stuff — thanks.